We are your source for wonderful cottage accent furniture! We have the best in extremely useful cottage entry way lockers and entire entry & storage systems. There is always a need to organize busy entry ways and spaces in cottages, and we have all the solutions, with wood lockers, mudroom storage units, and bench & shelf combos. Our furniture is solid knotty pine, made to be used and last. No air nails or staples—we screw & plug for the best in durable lasting construction. Our designs are perfect for your cottage or country decorating. See our extensive color choices for your perfect cottage decor. Most orders ship out within two weeks! See our awesome cottage signs! 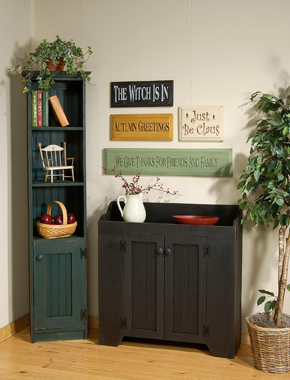 Cottage signs and solid pine cottage furniture are in high demand right now. Our fantastic cottage signs have continued to be one of the hottest decorating trends. Changing your cottage decor is as easy as switching signs for the seasons & holidays! We have cottage hutches ranging from 1' wide up to 4' wide x 6' tall. We have a wonderful birdhouse decor hutch that you can choose a different color roof and backing to compliment your cottage decor. 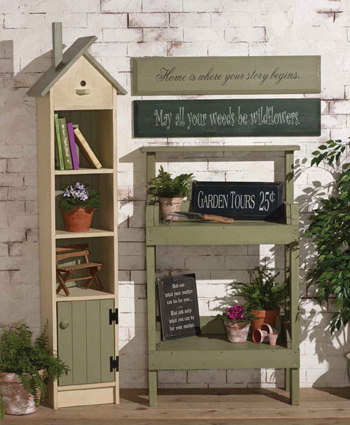 Line up our cottage hutches & bookcases to make entire wall systems. We have small hutches, large hutches, and some in between! Skinny hutches are great for cottage bathrooms, medium 2-3' wide hutches are great for cottage kitchens and bedrooms. Large 3'-4' cottage hutches are great for living rooms. Use them for anything or anywhere you want! Don't forget, if you don't see what you need in our standard line, we also make custom furniture. Let us build exactly what you need. We make great cottage benches! 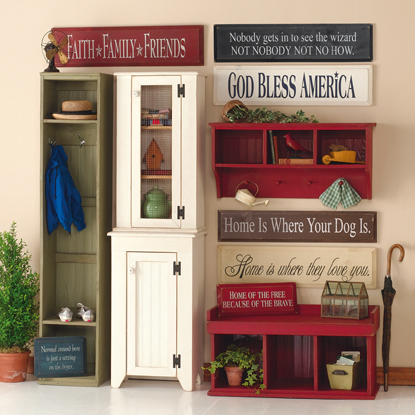 Use our storage benches on porches, or in entrys, bedrooms, halls, bathrooms, etc. We make large benches perfect for mudrooms and entrys, and small benches work great in a bathroom, or for a little extra bedroom storage. We offer fantastic cottage tables. Create coordinating table sets, or mix-n-match our different styles of end tables, coffee tables, and sofa tables. Don't forget our hall tables, media tables, and TV tables...all available in any color to go with your cottage decor! Looking for cottage cupboards & dry sinks? We make quality wood cupboards, cabinets, trash bins, recycle bins, and dry sinks. Put a cupboard or cabinet in your bathroom, or try the dry sink in a bedroom for great cottage-style decor with storage. Our trash bins work great as a clothes hamper too! Not sure what a dry sink is? Check out our information and ideas for dry sinks. Find stylish storage with our trunks, chests, and toy benches. Convenient cottage storage is easily available with our solid wood trunks, chests, and toy benches! Hide toys and provide fun seating for kids, or store blankets and also have a stylish trunk for the foot of the bed. Try one as a cute cottage coffee table - with storage! Don't forget our coat racks, cottage shelves, and wall cupboards. Wall cupboards are perfect for cottage kitchens, and who doesn't need extra space to hang coats? Use our cottage wall cupboards and shelves for extra storage in the bathroom too, the options are endless!